Last year, in August 2010, two of our regular testers tried out three of the biggest selling items in the NATorigin range: the Mascara; the Pencil Eye Liner (which was the winner of the Natural and Organic Awards 2010 Best New Natural Beauty Product); and the Eye Make-Up Remover Emulsion (a finalist in the same category), and we reported their findings and experiences. One year on, our same testers are back to put another three NATorigin products through their paces – Facial Cleansing Milk, Facial Cleansing Water (toner) and Regenerating Lifting Serum. Here’s what they had to say. The Facial Cleansing Milk has 98.5% naturally sourced ingredients and its pH is identical to that of skin. It boasts protective antioxidant organic arctic raspberry seed extract, stimulating red seaweed extract and anti-inflammatory, cellular-rebuilding brown seaweed extract. For further information and to purchase, click here. The Facial Cleansing Water is made from 98.4% naturally sourced ingredients, with a pH identical to that of skin. Like the Facial Cleansing Milk, it boasts protective antioxidant organic arctic raspberry seed extract, stimulating red seaweed extract and anti-inflammatory, cellular-rebuilding brown seaweed extract. The serum is made from 99.5% naturally sourced ingredients. It boasts a naturally-sourced tensing active mix (of acacia rubber and polysaccharides) that acts instantly to stretch and mechanically smooth the skin, leading to a visible reduction in wrinkle depth and over time aims to reduce skin ageing. Like the Cleanser and Toner, it contains nourishing, hydrating organic arctic raspberry seed oil and moisturising, softening, regenerating red seaweed extract. Hazel that she would be inclined to choose the products over her more usual scented products on account of the natural ingredients. Stefanie also added that she would have liked to see instructions on the products themselves, that overall her skin has felt wonderfully hydrated since she started using them, that she would use all products again – and recommend them to a friend with psoriasis. 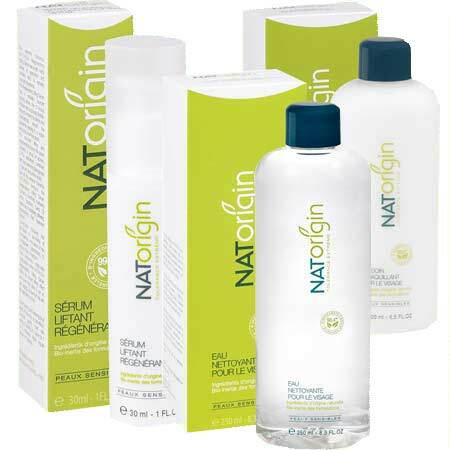 The NATorigin range boasts exceptional ‘free from’ properties: all products are free from alcohol, parabens, phthalates, mineral oils, silicones, SLS/SLES, petrochemicals, nickel, chrome, DEA, MEA, TEA and PEG. As far as food allergens are concerned, they are free from dairy products, peanuts (but not tree nuts) and both wheat and gluten.